click photo to enlarge I had been itching to get out to the desert to see the spring wildflowers. We have had more rain this winter then at any time in the past 100 years. We will most likely end the season with the record for the most rain ever in recorded history. 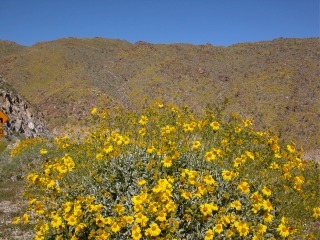 This has made for some very pretty hiking and now 100 year blooms in the deserts. 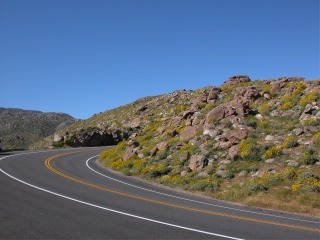 This view is taken on S2 going down Montezuma's grade into Borrego Springs. click photo to enlarge The further down we went the more profuse the blooms. 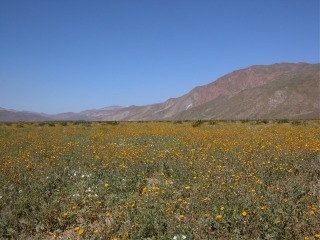 The hillsides in the background are just covered in blooms. The hillsides are all rock. These flowers are coming out of the rock. 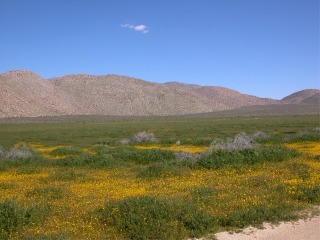 We have gone down to Borrego Springs every spring for the last 4 years to see wildflowers. This year the blooms are just incredible. click photo to enlarge If you look closely into this picture you will see there are other flowers underneath the yellow canopy. 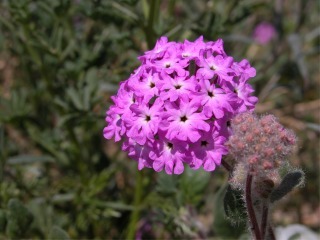 There are white and purple flowers blooming. If you get out and walk you can enjoy all the colors and enjoy the beautiful aroma of all the flowers blooming. This photo is along Henderson Canyon road in Borrego Springs. click photo to enlarge This photo was taken in Blair Valley. It was a wonderful day in the desert. It was 87 degrees. Back at the house we had a heavy marine layer and it never got out of the low 60's. click photo to enlarge This is one of the purple flowers hidden under the yellow canopy of flowers.